Anders, Lou. 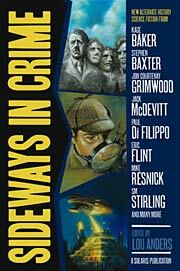 Sideways in Crime: An Alternate Mystery Anthology . Solaris 2008. Summary: Anthology of new allohistorical crime stories, including Kage Baker's w88 android, Stephen Baxter's "Fate and The Fire-lance", Tobias Buckell's "The People's Machine", Paul Di Filippo's "Murder in Geektopia", Jon Courtenay Grimwood's "Chicago", Theodore Judson's "The Sultan's Emissary", Jack McDevitt's "The Adventure of the Southsea Trunk", John Meaney's "Via Vortex", Paul Park's "The Blood of Peter Francisco", Chris Roberson's "Death on the Crosstime Express", Mary Rosenblum's "Sacrifice", Kristine Kathryn Rusch's "G-Men", and S.M. Stirling's "A Murder in Eddsford", plus non-allohistorical work by Pat Cadigan and by Mike Resnick and Eric Flint.